Innocent, nice, vivid, and unique might be the words that make up the acronym I.N.V.U., but title of the first shoujo Korean manwha to make its way Stateside is actually pronounced exactly as it looks. I.N.V.U., or I Envy You, is the brainchild of Kim Kang Won and is the epitome of everything that makes shoujo one of the most unique genres of graphic literature. 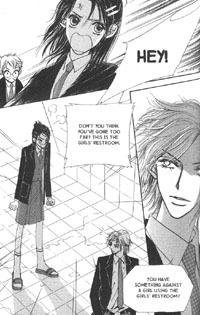 From the unique panel layouts that continue the shoujo tradition of breaking the collective panel border ideology, to the multi-dimensional characters that aren't what they immediately seem, I.N.V.U. will have both female and male readers roped in after only a few pages. Everything begins with Sey Kang, as her room is suddenly and unexpectedly violated bright and early in the morning by a band of noisy movers. It would seem that Sey's mom forgot to inform her daughter that her life would suddenly get turned upside down when she decided to spend the next five years in Italy working on a novel. Not only has Sey's mom rented out the house, but she's also forcing her daughter to move in with a new family with some equally freaky personal problems. Luckily for her, she's been given her mom's American Express Gold Card. However, she doesn't want to use it. Instead, Sey wants to become independent and earn her own way. Smart move or not, it's a decision she'll have to live with as she learns to juggle both school, extracurricular activities, and a part-time job working at a local gas station. Behind Sey's rather sweet looking exterior lies a girl full of hopes of one day becoming a news announcer. One of her best friends, Rea, shares a similar dream of one day becoming a movie star. Unfortunately for Sey, something always seems to muck up those plans. So, for the time being, her gas station attendant job will have to do. The only thing is, she has to roller-blade around at work since the place is so big... and she has little to no coordination. Enter bad boy, Siho Lee, to shake up boy-dislikin' Sey's little world... but not if his girlfriend, Rea, finds out he's thinking about two-timing her. 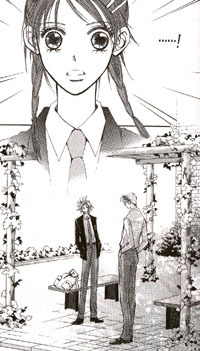 Ah, but shoujo titles always have some sort of convoluted love triangle going on, and this books' other relationship is with none other than Sey's homeroom teacher, Hajun Cho. Yes, a teacher-student relationship that's definitely showing signs of a spark. But wait, that's only part of the story. I.N.V.U. has an entire flip side that revolves around Sey's new gender-confused brother/sister. Physically, Hali Kang is a female, however, a freak car accident that killed her younger brother and hospitalized her mother resulted in some traumatic mental scars -- not for Hali, but rather for her mother who lost all memory of her daughter and believed that her son, Terry, was still alive. Forced by her dad, Hali begins dressing like her dead brother and even takes on the name Terry. From that point on, her attitude takes a nosedive, as she becomes more crass and argumentative and even picks up smoking. The pinnacle of her change is represented by her new hairstyle, which is bright orange and just short of shoulder-length. When she transfers into Sey's school, a long-buried wound is ripped open as she comes face to face with the tutor who broke her heart years ago, Hajun Cho. Confused? Don't be. The story might seem complex, and it is, but it isn't as overwhelming to read as any other title on bookshelves today. The only difference is that readers will have to get used to all the Korean names. It'll take some practice to get in the habit recognizing and easily reading the names, but it shouldn't be any more overwhelming than seeing a new Japanese or Chinese name in another book. Current TOKYOPOP readers will find a lot to enjoy about I.N.V.U. 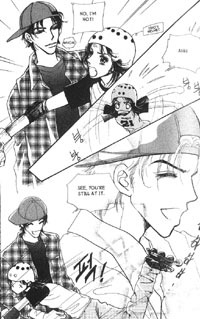 -- it really begins to show just how tied together the many different themes of shoujo manga really are. Paradise Kiss fans will enjoy the fashion segments and Mars lovers will find a lot to like about the complexity of the characters' pasts. Without the success of both previous shoujo titles and early manwha releases, it is doubtful that a niche title such as I.N.V.U. would have even been considered for a domestic release. Let's just hope that there's plenty more to come.